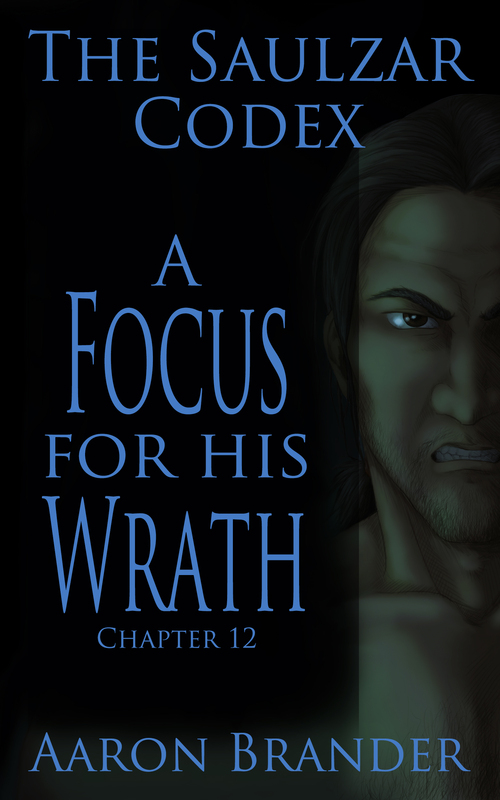 I’m happy to announce that A Focus for His Wrath is available! It is the twelfth and final chapter in the Saulzar Codex – a series of short stories focusing on Saulzar, a fierce warrior battling to overcome his own past. You can learn more about the project here. I’d love for you to stop by and pick it up. It’s a short story at 12,000 words and is priced at $0.99. The falling rain did nothing to lighten his mood. He trudged down the muddy road, the Poi River to his right, a broken past of failure and death behind him. He yearned for the wild and free days he spent with Mane and Dane, with the pack of wolves he had cultivated and led. But they were gone. Slaughtered in a stunning betrayal that haunted his steps. Dark thoughts swirled in his mind, stirred by all that could have been and would never now be. He thought of Omen Taru, his master from the Durrant Heil, whose last act was to try and redeem him. He wondered at the bright spark in his soul that the sword made; the sword Omen Taru bade him take. “Balance,” Omen Taru had said. But there was no balance. No hope to his desperation, no goal to his aimlessness. The rain poured down, dripping off his long hair, rolling down his face. He did not care. He moved south because he knew he should, but with no hope of redemption, restitution, or revenge. He was a ship cast upon the ocean without a rudder. A shrill scream reached him through his haze of downcast thoughts. He looked up and squinted into the rain. He was surprised that he was not alone on the road. A horse pounded north towards him. He jumped out of its way and noticed a look of terror upon the rider’s face. The scream came again. Motion blurred in the rain a hundred paces down the road. The sword at his side pulsed, and he wondered again at its geas. His legs stretched into a fast walk, transitioned to a jog, then a dead sprint. The katana flashed into his hand, and a blinding need to deliver justice swelled through his arms. As he closed, the shapes became clear. A wagon with a broken wheel. A dying horse. Two bloody and twisted corpses. Two armed bandits dragging a screaming young woman off the road. A third man wringing his hands in anticipation. Justice was needed. The sword demanded it. Saulzar would deliver it. He roared his intention, and the first bandit received a thrust different than he had thought to deliver. The katana snapped a rib, sliced his heart in half, then burst in a bloody spray out his back. Saulzar twisted the blade and tore it loose. The two men had dropped the girl and were drawing their swords. Saulzar pivoted from the dying bandit and closed with the nearer enemy. His sword snapped down and the man’s weapon and hand fell to the ground. Saulzar drove his shoulder into the man’s chest, knocking him down, then spun left and met the strike from the final bandit. The man’s fear drove his sword in a frenzy, forcing Saulzar back a step. The man’s eyes widened in triumph, for he saw the retreat as weakness and not the trap it was. Saulzar continued to step slowly back, catching the frenzied strokes on his katana and effortlessly redirecting them to the side. The man pushed forward, strikes coming fast and furious, victory shining in his eyes. The man stumbled, his feet tangled on his comrade’s separated sword hand. Saulzar struck, too fast for the man to counter, the katana’s blade piercing his left eye and punching through the back of his skull. He snapped the sword back and free of the man’s skull. The head bowed as it followed the sword, as if accepting the veracity of the judgment, then its dead knees buckled and slumped to the ground. The living bandit whimpered as he cradled his bloody stump of an arm. He tried to stand, but stumbled and fell to his knees, both arms reaching out to stop his fall. The wounded arm ground into the mud, and the man screamed in pain.